Command Sergeant Major Timothy Allen Bolyard, age 42 of Ft. Benning, GA (formerly of Thornton, WV) was killed in the line of duty in Logar Provence of Afghanistan on Monday, September 3, 2018. He was born January 15, 1976 in Morgantown, WV a son of Marvin D. and Sandra Jo (Isner) Bolyard. He is survived by his beloved wife Amy J. (Lynn) Bolyard of Ft. Benning, GA; three children, Preston A. Bolyard of Colorado Springs, CO, Casey L. Settle (Leanna) of Maricopa, AZ, and Melanie Rose Bryan-Brown (Richard) of Montgomery, AL; three grandchildren, Alana and Jaxon Settle of Maricopa, AZ and Jamysen Rose Bolyard Brown of Montgomery, AL; one brother, Jeffrey O. Bolyard (Roseann) of Reedsville, WV; one sister, Melissa K. Bragg (Criss) of Grafton, WV; three cousins who Timothy thought of as his brothers, Jackie Wolfe, Glenn L. Bolyard, Jr., Jason A. Bolyard and special friend, Steve Collins; four nephews, Jesse, Cody, and Zach Jennings and Haden Kennedy; two close mentors, Retired 1st Sgt. Jason W. Christner and Retired 1st Sgt. Ken Godfrey; and also many officers and NCO’s Timothy served with during his 24 years of service. He was preceded in death by his maternal grandparents, Bob and Marie Isner and his paternal grandparents, Obed Junior and Anna Bolyard; and also survived by several aunts, uncles, and cousins. Timothy graduated from Grafton High School with the Class of 1994 where he was known as “Caveman”. He enjoyed the outdoors including hiking, fishing, hunting, and was a “grill master”. Immediately following graduation from GHS he joined the United States Army. He entered OSUT training in 1994 at Fort Knox, Kentucky where he was awarded the MOS of 19D, Cavalry Scout. Since that time, Command Sergeant Major Bolyard served in a variety of positions to include Dismounted Scout, Driver, Gunner, Team Leader, Squad Leader, Section Leader, Platoon Sergeant, First Sergeant, Armor Branch Sergeant Major at Human Resources Command (HRC), Operations Sergeant Major at the Squadron, Brigade Combat Team and Division level, and Squadron Command Sergeant Major. He served as the Command Sergeant Major of the 3rd Squadron, 1ST Security Forces Assistance Brigade at Fort Benning GA. Upon completion of OSUT he was assigned to C Troop, 1st Squadron, 7th US Cavalry, Fort Hood, Texas, 1st Battalion 6th Infantry, 2nd Brigade Combat Team, 1st Armored Division, Baumholder, Germany, 1st Battalion, 8th Infantry, 3rd Brigade Combat Team, 4th Infantry Division, Fort Carson, Colorado, 4nd Squadron, 10th US Cavalry, 3rd Brigade Combat Team, 4th Infantry Division, Fort Carson, Colorado, Human Resources Command, Fort Knox, Kentucky, 1st Squadron, 10th US Cavalry, HHT 2nd Armored Brigade Combat Team, 4th Infantry Division Headquarters Fort Carson, Colorado, 3rd Infantry Division Headquarters and 5th Squadron, 7th Cavalry, 1st Brigade Combat Team 3rd Infantry Division Fort Stewart, Georgia. Command Sergeant Major Bolyard has deployed ten times in support of contingency and combat operations around the world. 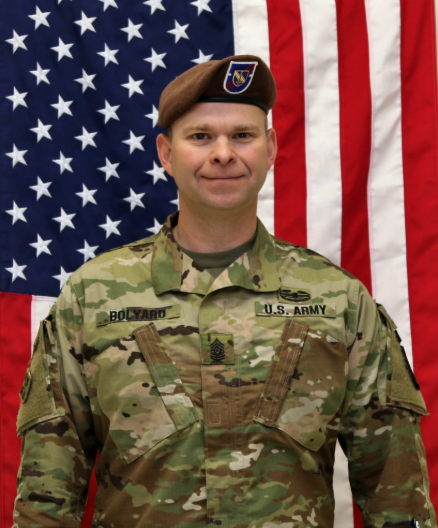 Command Sergeant Major Bolyard’s awards and decorations include the Bronze Star Medal with Valor (1 OLC), Bronze Star Medal (3 OLCs), Meritorious Service Medal (3 OLC), Army Commendation Medal (5 OLCs), Army Achievement Medal (8 OLCs), Good Conduct Medal (7th award), National Defense Service Medal (with star device), Armed Forces Expeditionary Medal, Kosovo Campaign Medal, Iraq Campaign Medal, Global War on Terrorism Expeditionary Medal, Global War on Terrorism Service Medal, Humanitarian Service Medal, Armed Forces Service Medal, NCO Professional Development Ribbon (with 4 device), Army Service Ribbon, Overseas Service Medal, United Nations Medal, NATO Medal (with star device), the Combat Action Badge, Drivers Badge wheel, The order of Saint George Bronze Award and is also a member of the Sergeant Audie Murphy Club. Command Sergeant Major Bolyard is a graduate of the Combat Lifesaver Course, Small Arms Maintenance Course, Primary Leadership Development Course, HAZMAT Storage and Transportation Course, Master Fitness Trainer Course, 19D Basic Noncommissioned Officers Course, Scout Leader Course, 19D Advanced Noncommissioned Officers Course, and the Sergeants Major Course class 63. He holds a bachelor’s degree in business administration from Excelsior College in New York. The family will receive friends at the Donald G. Ford Funeral Home 950 George Washington Hwy., Grafton on Tuesday, September 18th from 12-8 p.m.
Funeral service will be conducted on Wednesday, September 19, 2018 at the Message of Freedom Church (beside the funeral home) at noon with Pastor Phil Nestor officiating. Military graveside honors will be conducted. CSM Bolyard will lie in state from 11:00 a.m. until the funeral hour.